This package contains two courses: Psychology of the Body (12 hours) and Psychological Defenses and Boundaries in Massage Therapy (6 hours). Take each course when it fits your needs. As a massage therapist, bodyworker, somatic practitioner, or any type of manual therapist, you hold more than a client's physical body in your hands, you also contact a person's psychological and emotional dimensions. For both bodywork students and practitioners, this course is designed to provide a greater understanding of the psychological issues that can arise from using touch in their therapy sessions. The corresponding course text, The Psychology of the Body, explores the connection between the body and the mind, how touch affects this connection, the client's emotional reaction and release, the profound dynamics of armoring, how to respond to the client in an appropriate manner and the underlying psychological factors that influence the massage therapist-client relationship and the outcome of your work. Learn new insights into the psychological factors that influence your work and your client relations. Based on the text The Psychology of the Body, this course explores the ethical issues related to the psychological defenses and body boundaries that profoundly influence people. Learn fresh approaches to recognizing and responding to ethical issues; using therapeutic frames, and confidently collaborating with mental health professionals. The textbook includes numerous case studies and suggestions for applying the concepts through self-directed exercises. This is the best course that I have taken to date. I feel more confident and professional with my clients and more prepared within my boundaries, in supporting them with their emotional issues and therefore their body issues. The beginning seemed tedious and overstated but the obvious need for that was for people newly out of school. The psychological and body type information was facinating and I was glad to see the references to read further with those authors (A Lowwen, etc). Great book. This course has opened my mind and has made me motivated to work with people who suffer from mental disorders and addictions.I am grateful I took this course! This type of subject seems to be so intricate that I wanted to take my time and assimilate the information. I fully understand that with this 12 hour course that I CANNOT diagnose any type of mental illness. This course did help me understand the physical affects on the body that the mind and emotions have on us as humans; and that was of great interest to me. The Psychology of the Body Course was very thought-provoking and truly put me through the paces regarding ethics in Massage Therapy. It helped define further the limitations on our profession's scope of practice, and gave me new ideas and insights into how I can grow as an LMT. Thank you for offering this, Psychology of the Body by Greene and Goodrich-Dunn belongs on every therapist's bookshelf. Very detailed text, but a little long winded, could tighten it up, less repetition; that being said, intellectually above average which is greatly appreciated compared to other online courses, overall, book is an impressive work. I have, after 15 years in the profession have been a better massage therapist this week applying principles emphasized in this course, I made a point to talk less to my clients and listen to their words and bodies more (and I already have been doing this...) I did it better and will do it even better going forward because of this course. The most intellectually stimulating online course I have taken. The test was also well-constructed. Thanks to the authors of the text for a well-thought out and organized book. I really enjoyed this course and I am very glad it is offered. I have a massage license as well as a BA in psychology and a MA in Human Development Counseling. My career goals involve more than just providing massage therapy. I want to teach people how emotions,thoughts,and feelings affect our over all health and well being. I would like to be known as a bodywork counselor. Therefore, I would love to see more of these types of courses Thanks! I really enjoyed this course and actually shared it with my Primary Care Physician because I brought the book to an appointment. She was very interested in it and may purchase the book for herself. It gave excellent insights and valuable ways to handle different situations with clients regarding Psychological issues that can come in session. I am going to keep this book in my office for a reference guide. This course was well put together and informative. I liked the way that the book flowed in a logical manner and was broke up into sections for each condition. The material was dry in places but I found it interesting over all. Great course. I think this should be an integral part of basic massage therapy school. Invaluable material. I wish this course was included in the massage school I attended. It would have explained it alot better than the little book we had for boundaries. I thought this class was excellent. Full of good, useful information. Thank you! The textbook has illustrations which make it look lame, but the words and meanings of this text do reveal much. The material is well sourced in this text, and show authors who did their homework in putting together a book of substance. Very valuable information for my practice and my professional growth as a massage therapist. Course was great and I gained a great deal of knowledge which I will be able to carry over into my day to day massage therapy as well as life in general. I would have liked to have had more information on why stress gathers in various body areas (ankles, wrists, knees, etc). I previously ordered a different course that was not accepted by Texas and I had no idea. The staff contacted me, told me and asked if I wanted to switch courses. Just for that I am loyal and will only get my courses from you guys. I was very impressed by that level of customer service. Also the course work switched it out to was fun and interesting. I am very pleased. I'm glad I went with the Institute. 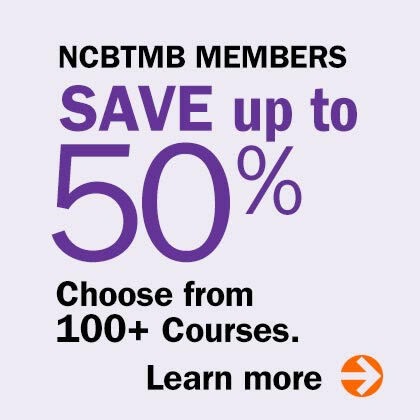 They helped me in picking out a course. At first I thought PSYCHOLOGY OF THE BODY was going to be boring, but I was very wrong. It got my attention and before I knew it I was done reading it. Thank you. One of my fav courses you have offered, and I have taken many.. :) thanks again for a great course!! Great course..bought it cause it was on sale and found that it was very informative and interesting. I am very glad that I purchased this course! Enjoyed the book, intend to go back and read it at my leisure. I appreciate the material, I learned a lot about myself. Thank you. After nearly 17 years of practicing massage therapy, The Psychology of the Body confirmed many of my intuitions about my experiences. I wish I'd read this book sooner; it should be a standard textbook in every massage school! This is, without a doubt, the best continuing ed class I have taken. I wish this material had been taught in massage school. It's a shame I had to wait 11 years before taking this course. I have never been disappointed in a course from I. I .H.. The ethic courses are always varied and interesting! Incredible, I soaked up the information. It was conveyed in a digestable and organized way. I would highly recommend this course. Great topic. Very good text. Was blown away by the information I learned here. Now I have re read it so I can store it in memory...takes me awhile. I very much enjoyed this online course of The Psychology of the Body. Course did not sound interesting when I selected it, but there are many topics that will help my practice in the future. Excellent course. I would recommend it to others. This course was very insightful. the reading material took me alot longer only because I am a detailed person and in order for me to keep the info on my head and not just read through it, a number of things had to be reread in order for the info to stick. this info should be mandatory in all massage therapy schools no questions asked. I thought that some of the information was too specific and while it was interesting to me as a student of human nature, I'm not sure it will have as much effect on my practice as a massage therapist. The nature of my relationship with clients both at the day spa and with my home practice (where I have more returning clients) is much more focused on the physical. I learned more than I will use, but still found the course valuable. While this is a great course for online, it did create within me a desire to take this as a live class at some point. Very interesting. Thank you. The psychological concepts were described incredibly well. There many ethical issues that were addressed and clarified in this course. Material was extremely well presented and the test was excellent as well. I have been practicing bodywork and teaching in massage schools for over 25 years, and I was very pleased with the book and the detailed information in the book. I learned a great deal from the book. Thank you. It was harder than I thought it would be, but totally worth it! plus I did great! I thought it was an excellent course; lots of valuable information that was presented clearly. I am very glad I chose it. I found this course truly amazing and hold this level of professionalism in the utmost regard. I truly thank you for the ability to further my education through your services. This course was more interesting than I anticipated. Having degrees in psychology and social work as well as massage therapy, the topic is imperative to my work. I appreciated gaining more insights. Thanks! The book/course presents a body-centered view of ethics that is especially useful for massage therapists. This is the first on-line course I've ever taken. Before I took it, I couldn't imagine taking a massage therapy course without "hands on". But this course was more about knowledge and understanding vs. technique. The insight I got out of this course is invaluable! I intend to take several more courses from your institute. Thank you for having such an extensive and diverse number of courses, and for your institution's organized, easy-to-follow system. Also, every time I called with questions, everyone I spoke with was extremely helpful, friendly, and courteous! Thank you again for this wonderful experience! I gained a lot of new knowledge regarding Psychology of the Body that I was not aware of. Material was easy to understand and very informative. I really liked this course and would recommend it to another person. Information presented was very informative and interesting. I think this will aid my understanding of client issues and how to deal appropriately with these. I am going to thoroughly read this material I was on a time crunch but I have a psychology degree and this was really great information not only for my practice but my career in counseling. Thank you! The textbook was excellent. I know I will continue to refer to this book for knowledge. This course over exceeded my expectations, I was very pleased and interested. I actually had read the text a few years back and revisit it on a regular basis. This book changed how I practice massage therapy, and took me to a much higher level of understanding with my role as a healer. This book is, in my opinion, essential in the practice of massage therapy. This represented a new way of looking at the work that I have been doing. It will take additional study to fully understand exactly where all of this is leading. 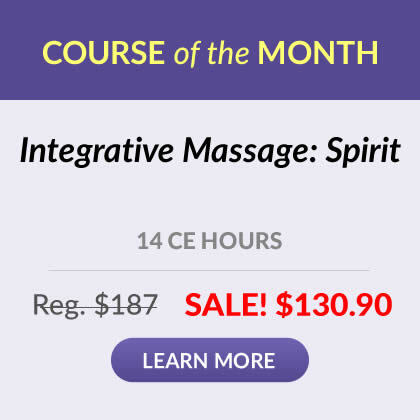 Excellent course - should be required in massage school curriculum. If you want to understand the body/mind - read this book! I loved this course. I want to go further as it inspired me to grow as a therapist and a person. This was an excellent course and a valuable & useful learning experience. I look forward to utilizing future course offerings. Thank you so much for your insight! I learned so much, and opened my mind to new possibilities of understanding my clients on a whole different level. Very informative and well done. It provided a lot of information that I had never heard in my last 10 years of practice. Very satisfied. This was my first time taking courses from you. I was very pleased in all aspects of this course! Thank you!